Dal 15 Febbraio al 3 Marzo il ‘Shizuoka City Cultural and Creative Industries Promotion Center (CCC)‘ ospiterà una grande mostra su Hands on Design. Nei due piani del moderno centro culturale di Shizuoka presenteremo tutti i nostri artigiani, le loro tecniche di lavorazione e i prodotti che sono nati dal 2015 ad oggi in collaborazione con i tanti designer del nostro team. Presenteremo inoltre tre nuovi artigiani e alcune anteprime dei prodotti della nuova collezione 2019. Ringraziamo Keiko Suzuki e CCC Shizuoka per l’organizzazione e il coordinamento. 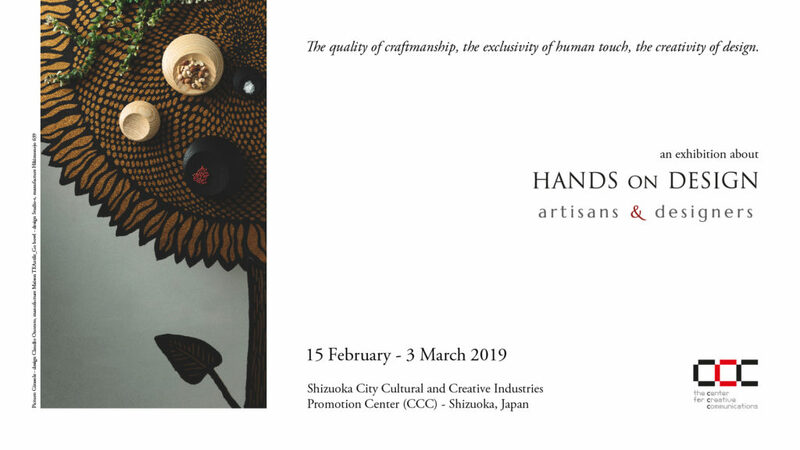 From February 15th to March 3rd the ‘Shizuoka City Cultural and Creative Industries Promotion Center (CCC)‘ will host a major exhibition about Hands on Design. On the two floors of the modern cultural center of Shizuoka we will present all our artisans, their working techniques and the products that were born from 2015 to date in collaboration with the many designers of our team. We will also present three new artisans and some product previews of the new 2019 collection. Many thanks to Keiko Suzuki and Shizuoka CCC for the organization and coordination. Artisans: 224 Porcelain, Banshu Hamono, Bottega Intreccio, Ercole Moretti, Lorenzo Franceschinis,Hikimonojo 639, Kaikado, Kanaami Tsuji, Andrea Luppichini, Maison TEAxtile, Maruyoshi Kosaka, Shuji Nakagawa, Shibaji Ochiai, Risogama, Takeo Shimizu, Soffieria, Solimene Art, Takirai Design, Natsuko Toyoufku, Tumar, Hiroaki Usui.